WD-40 Multi use Aerosol Review BackyardToolshed - All your tool needs in one place! WD-40 is basically a protective spray. It is a mixture of chemical concentrate suspended in a high grade petroleum distillate that plays an amazing role in preserving metals. This is an excellent multi-purpose product which can be used for many problems. It is huge and will take a huge space in your tool box but at the same time it is manageable and pretty much convenient to use. It is attached to a straw which allows you to use it as a fix delivery system. The straw is designed in a narrow manner that makes it comfortable to work with it. For a full comparison of this oil with similar products, check our buyers guide on penetrating lubricants! You can simply lift the straw at an angle of 90 degrees for more precise results. With the help of straw, you can reach the areas which are hard to reach. In case you want wider sprays, you can push the straw pack down against the bottle and can use it as a normal one. WD-40 provides you with a wide range of specifically designed products that help you in many ways and in variety of fields. It can meet the specific needs of the trades and industry professionals and any demanding job that needs to be done right. The brand offers a variety of bicycle maintaining products that will take care of your bike all around the year. Let us move further to know about the advantages and utilization of WD-40 Aerosol. Automotive: Aerosol is an excellent product that can easily satisfy your monitoring needs such as cleaning and protecting engine from unnecessary grease and tar. The solution gets under the dirt, marks and grease and simply wipe them away. The lubricating ingredients of the engine are widely dispersed and firmly deposits to all the moving parts. Preserve your tools: The solution protects your tool from rust and corrosion. It cleans and lubricates them and extends their life. The solution is made from corrosion-resistant ingredients and thus it saves the metal surface. Home and garden: Aerosols can be used around the home and garden. It simple removes all the dust and grease from vital accessories of your home including squeaky door hinges. Cycling and leisure: You can opt aerosol WD 40 for the life and everyday maintenance of your bicycles and bikes. It can remove dust and grime from your bike efficiently and protects your vehicle against rust and corrosion. Electrical circuits: There is one more efficient usage of aerosol. It dries out the electrical systems and eliminate the risk of moisture-induced short-circuits. 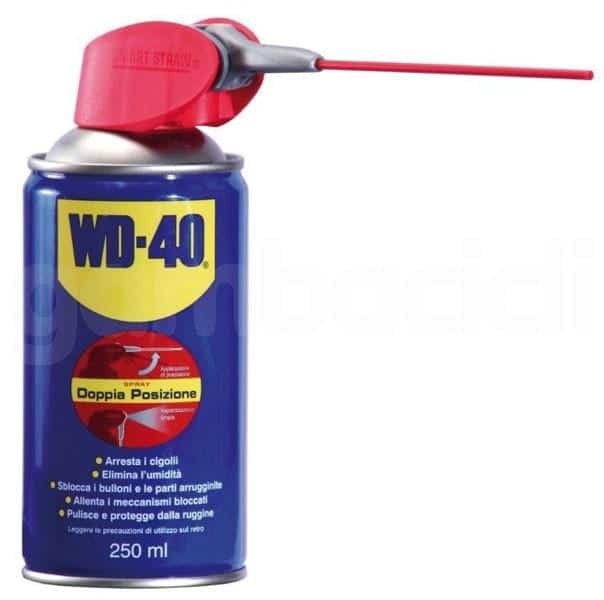 WD-40 Aerosol works on a specific technique. It loosens rust-to-metal bond and free those metal parts that are stuck, frozen or rusted. It does not have an adverse effect on fabrics, rubbers or plastics. Its working temperature lies between minus 100 and 300 degrees F. The best part of this solution is that it has the capability to penetrate through the minute grains of the all the metals. It can be fatal if inhaled or swallowed.